This set of photos was taken on May 24, 2016 at 6:48 PM. The location was in the drive entrance to a very nice hotel in downtown Washington DC. The "Take It!" was from a set of wondrous circumstances. As I drove into this partially enclosed driveway entrance, I pulled in as close to the partial wall on my left as I could, to temporarily park, and still have space enough to get out of the car. As I was doing this, I noticed a reflection on the wall next to me, which I knew I would enjoy investigating just as soon as I got out of the car. The conclusion of the viewing did not dissapoint. 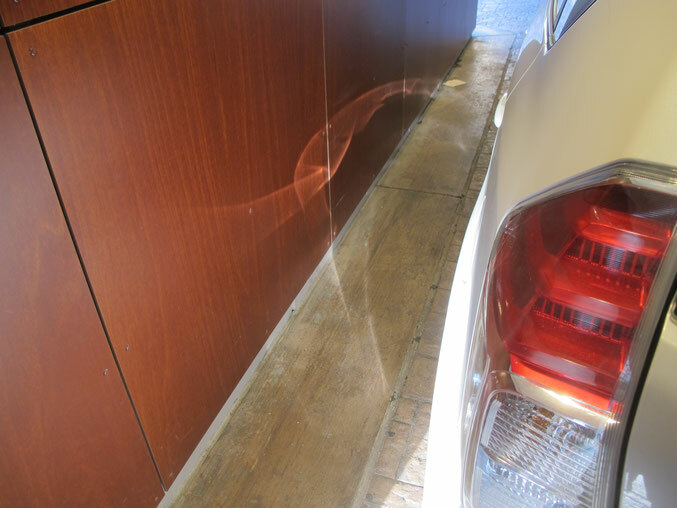 The reflection on the wall was formed from my having pulled in just far enough to allow for the sun to bounce off the white paint on the left side of the rear of my car. 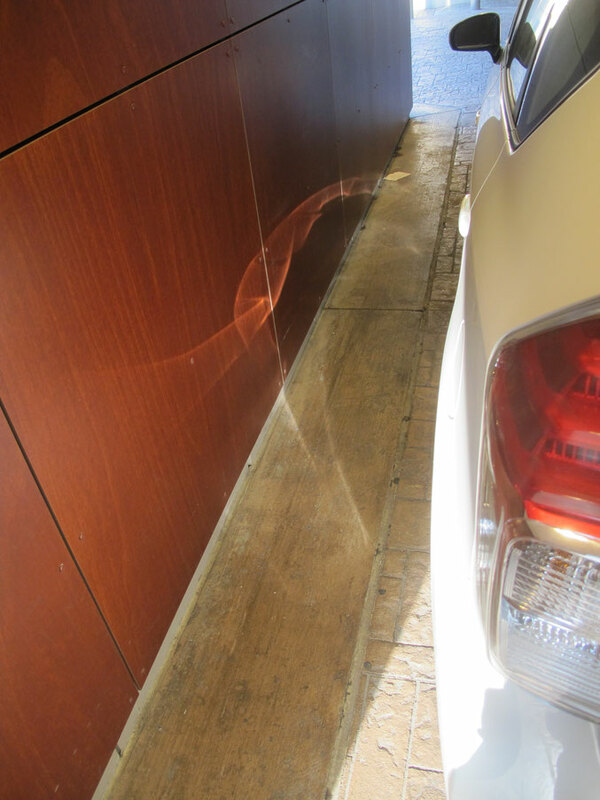 The angle of the sun was just right, in order to catch some of the contours in the painted metal of the body of the car to produce the complex reflection. My take on the reflection is that it is that of a human arm, starting at the shoulder to the rear of the the image. The reflection continues, in a side extension of the arm, through the elbow, down the forearm, and goes all the way into a hand that is at the downward opposite end of the image. It is even strange enough to portray the hand reaching for a piece of paper on the floor at the base of the reflection. The paper is just ever so slightly touching the wall, at the hand to make it even that much more realistic. I took the first shot, it sort of a state of disbelief. The second shot, taken in vertical mode, was to verify what I was seeing. The third shot, was taken a bit later, and shows some tire prints on it. I suppose these tread images, help in the authenticity of the match up of the illusion. I must say, as soon as I took the photos. I showed the camera image to a parking attentant, who was standing nearby. He could not believe what he was seeing in the camera, and quickly moved to the vantage point to see it for himself. We both stood there, sort of shaking our heads in wonder as the sun moved, and the image disappeared. The After Take: It is not often, that I have a photo opportunity made available to me, have such a vivid realistic interpretation so readily obvious. Life has many opportunities to delight and humble us all at the same time. Here is hoping you are having a great day. Thank you for sharing with me, this bit of wonder. You catch some really cool reflections. I rarely even notice these things, clearly I'm missing out. It almost looks like it's separate from the wall. Really cool looking. My garage gives me something similar to this only when my wifes car is parked in it. I stared at this one for a good 5 minutes trying to find the "shape in the clouds" as I often do with your photos, I couldn't make anything out. However, it is a beautiful design. I think you are to humble sir, it seems like this website is proof enough you find photo opportunities all the time, and if they aren't presented you make them. Great picture!